Do you like Save the Monsters? Share it with your friends. 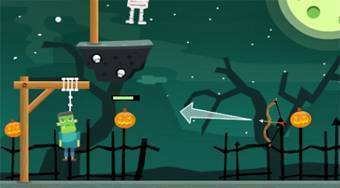 Save the Monsters is a great Halloween themed shooting game where you have a total of 21 different levels of difficulty. In each round, it will be your task to shoot arrows from the bow, hit them in the ropes and save the various monsters from a certain death on the gallows. Ten arrows are available in each round.